FELTON -- The aroma of wood shavings and varnish hung in the air at Hill Guitar Co. along with more than a dozen guitars in varying stages of completion Monday. 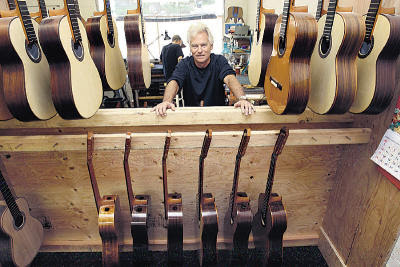 Kenny Hill's been producing classical and flamenco guitars in the San Lorenzo Valley for more than two decades, but with his new shop on Highway 9 he's preparing to ramp up production to meet increasing global demand for his high-end concert instruments. "I've been at this game long enough that it's really a golden age in my business," Hill said. "You work for 30 years and you're an overnight success, or something like that."